So I've been sent a new public cert to install on a server (.crt file). Done. Restart apache - "FAILED". I've checked the paths in my ssl.conf file, and they ARE pointing to the correct files. If I reinstate the old (expired) cert file, apache starts up ok, so it definitely doesn't like something about the new one. Any ideas what I might be doing wrong? Any more info you need? I also came across the same error. In my case I had to supply additional CA certificates in the verification chain. And instead of supplying the certificate and the key in separate files, I combined them in a .pem file. When reissuing my Rapid SSL certificate (purchased through Namecheap) to deal with the Heartbeat bug, the new certificate was always issued against the private key used for the previous CSR request. After about the fifth reissue, pairing that with the private key used in the fourth reissue attempt made things work fine. I had the same issue on one of my CentOS 6.5 servers recently and it was down to when I generated the KEY and CSR. I have three sites running on this server in virtualhosts all with dedicated ip's and each site has it's own SSL Certificate. Now what I really should have done was check my .bash_history files, as I have successfully done this in CentOS many times before. This then successfully generated the CSR and KEY, I re-applied for the certificate using the newly gained CSR, then applied the new certificate and added the new key file and finally then Apache would start cleanly. Also just to note after a little configuration we now score A+ in an ssl labs test. make sure all cert files are encoded using ANSI, not UTF-8. For me all tests said: key, crt and csr do match, but the logs said X509_check_private_key:key values mismatch until I saw that one of the files was encoded in UTF-8. After I fixed that, the error message changed to mention /some/path/server.pem. Note the different private key, which only differed in file extension. I had 2 different sites encrypted with different keys (meaning I had fixed the first site but now needed to fix the second site). So be sure to read the error message carefully! We also had the issue with NameCheap, the issued Cert matched the CSR that was used to generate the previous CERT. We let them know via their support page, and they said they already knew about the issue. Dynadot seem to have the same issues with the RapidSSL certificates they are re-issuing. I just received a non working certificate, which then triggered another issue with Apache, when that was fixed I found this question and answer here for the original problem, thanks for the information everybody. I shall be scrapping the RapidSSL Cert as I have some client compatibility issues with it anyway and purchasing a new one from AlphaSSL instead. According the FAQ on the Apache website, the modulus and the public exponent for the cert and the key must match so that is a valid check. The trickiest bit in my case is setting up the SSLCACertificateFile. Once the certificate company issued our cert, alongside it we received two additional certs: an intermediate and a root certificate. Which one to use for SSLCACertificateFile? 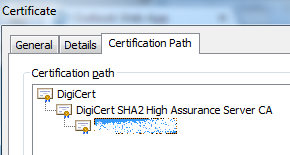 Both..
And for the SSLCACertificateFile I have to concatenate digicert_sha2_high_assurance_server_ca.crt and digicert.crt into one file in the mentioned order. Not the answer you're looking for? Browse other questions tagged apache ssl https openssl or ask your own question. Using key tool to make a CSR, how do I make a cert for tomcat ssl?